Absolute lake front position with direct access on to Two Mile Bay beach and Lions footpath (excellent walking/running, biking, swimming and boating. Sunny and centrally located. Only a 5 minutes drive to Taupo township and walking distance to restaurants, cafes and kayak and windsurf hire. 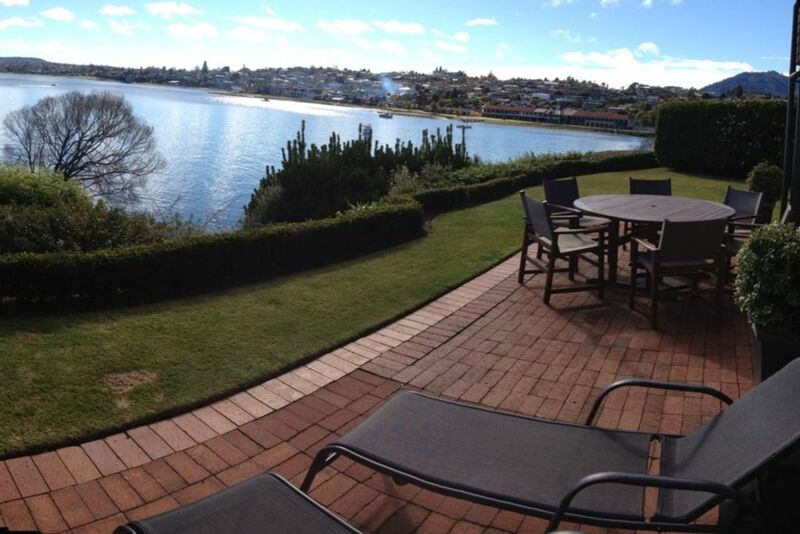 Panoramic uninterrupted views looking across the lake to Taupo and Acacia Bay townships. Private outdoor lakeside entertainment area with BBQ. Secure and quiet gated complex with good parking, own carport and a designated boat parking area. New lino and carpet (Dec 2013). Newly furnished and painted (Dec 2010). Apartment has an open plan lounge area, gallery kitchen and dining area, all with lake views. Downstairs queen bedroom has own en-suite. While the mezzanine floor includes a king size bedroom and a third bedroom with twin single beds, both with balconies and lake views, and second bathroom. Portacot, with mattress and linen available. Two nights minimum stay. Check out 11am, check in 3pm (negotiable upon request). Special rates apply for popular events/sporting weekends and public and school holidays. Negotiable rates for longer stays. A cleaning fee of $100 applies to all bookings (which ensures all beds are made up, clean towels available and apartment kept to a clean and tidy standard for all new guests).